My enrobed chocolates consist of cashew chews, coconut squares, dried cherry and almond chocolates, milk chocolate velvet squares, and my award winning creamy caramel cups with sea salt. My personal favorite, the cashew chew, has a wonderful cashew crunch combined with vanilla caramel, sea salt, and dipped in dark chocolate. 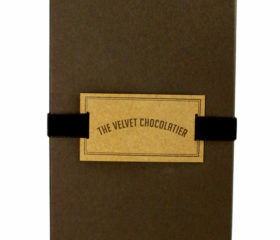 Your chocolate order will be sent Priority 3-5 business days within the Continental United States. 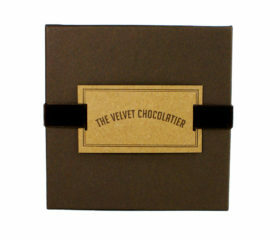 For any other locations, please contact me, ruthie@thevelvetchocolatier.com, for shipping options. 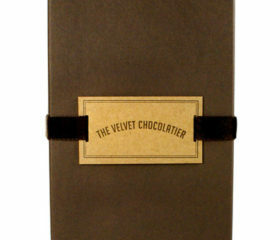 All chocolate should be stored in a cool, dark, dry space-out of direct sunlight. Please remember to never place chocolate in the refrigerator. The moisture from the refrigerator will ruin the chocolate.